Softball season is here and, as always, expectations are high for most of the local high school teams. 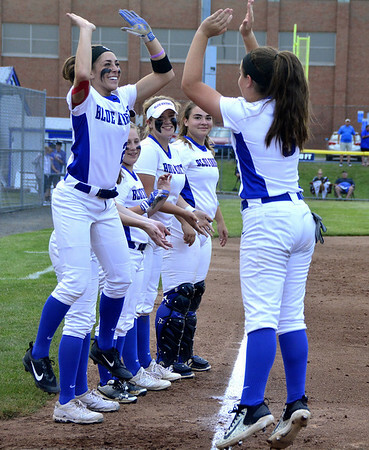 Southington should once again be a favorite to reach, if not win, the Class LL tournament after reaching the championship game last season. Head coach Davina Hernandez will have to replace some top talent that had been mainstays over the past few seasons and while that might be a problem for some programs, it should not be much of an issue for the Blue Knights. Outside of Southington, almost every other team - New Britain, Berlin, Newington, Goodwin Tech and Innovation - were able to reach postseason play in 2017. Plainville was the lone team that failed to qualify in its respective state tournament, but saw some improvements over a tough season. As is the case in every season, though, only time will tell. Outlook: The Hurricanes saw their win production increase by three from 2016 to 2017 and they hope to continue that trend this season. New Britain always brings plenty of athleticism and talent to the field. Most of the time, it’s just a matter of putting everything together come game time. But the Hurricanes have plenty working in their favor entering the season. They lost just three players to graduation and bring back a veteran roster that should feature plenty of talent, especially from senior shortstop Gabby Roy, senior catcher Cristina Velazquez and senior pitcher Gianna Gonzalez. Roy’s and Gonzalez’s production will be particularly important, because as they go so too does New Britain. Overall, though, it should be an interesting year for the Hurricanes and could be a fun team to watch. Outlook: After a small slump in the middle of last season, the Redcoats finished off their year on a strong note, winning eight of their final 10 games. And while the group will certainly look to carry over that momentum into this season, there will be some question marks along the way. Berlin lost a number of key players from last year and will have to replace four-fifths of its infield and two-thirds of its outfield. Standouts Vanessa and Grace Reimer and Jackie Arute among others have moved on, leaving Alexa Lanteri, Michele Cohen and Lindsay Walsh as those that will have to be even bigger contributors. But the trio was outstanding themselves last season. Lanteri hit .493 with 42 RBI. Cohen batter .328 and drove in 13 runs, while Walsh hit .424 with 17 RBI. How these three play could help determine what type of season the Redcoats ultimately have. Overall, Berlin is set to field a young and inexperienced team, but head coach Jason Pires likes the commitment and coachability his players have shown thus far. That could in the end help lead to wins. “I expect us to finish over .500 and compete in every game this season,” Pires said. Outlook: Like many of the other area softball programs, the Indians turned in a strong season in 2016 and for them, it will be a matter of building upon or trying to maintain that success. Perhaps the biggest question for Newington will undoubtedly be who will replace ace Kat Lagace in the pitching circle. An All-State player, Lagace threw almost all of the team’s innings a year ago and had few issues dominating opponents. Sophomore Danielle Pantano looks to be the prime candidate and got some valuable experience of her own pitching last season. Whoever is pitching, they should get plenty of help behind them in shortstop Cyan Gonzalez and first baseman Rachel Thureson. Both are three-year starters and both will be expected to help lead a young roster through the season. Overall, this season has the potential to go either way for Newington. Outlook: The expectation, like always, for the Blue Knights this season will be championship or bust. Southington came within a run of claiming its fourth title in six years before falling to Trumbull in the title game. The Blue Knights did lose some key pieces from last season, most notably catcher Maggie Scafariello and second baseman Michelle Woodruff. But like every year, it is just re-up and reload for head coach Davina Hernandez and by all accounts, there is plenty of young talent to go along with a solid group of veteran players. One of the most important of those veterans will be senior pitcher Kara Zazzaro, who went 18-3 last season. The intimidation factor is always important with the Blue Knights and Zazzaro certainly gives them that from the pitching circle. It’s still a little too early to tell if Southington will be back in the title game once again, but the Blue Knights’ odds are always so much better than most. Outlook: It was another rough season for the Plainville softball team in 2016. But while the Blue Devils went just 5-15, it was a two-win improvement from the season before and just like last year, this season should be about continuing the growth of the program. If anything, Plainville should be able to get a number of young players some quality playing time and build up their experience out on the field. Caitlin Bradley is the lone senior on a roster that contains five juniors, 14 sophomores and seven freshmen. Losing their main pitcher, Kiya Broughton, could hurt, so it will be interesting to see what the Blue Devils do from that perspective. Either way, Plainville can really only go up. Outlook: After getting into the Class S state tournament a season ago, the signs appear to be pointing up for the Gladiators. Goodwin Tech lost just one key player from a season ago and returns a nucleus that has played quite a few games together. Paola Barbosa is expected to be the team’s biggest offensive threat, while Valerie Ramirez should be the same from the pitching circle. Still, head coach Paul Soucy does see some issues for his team heading into the year, most notably with the Gladiators’ defense and overall inexperience outside of their key returnees. But the strength of his pitching staff does have him excited. It could be an interesting season for Goodwin Tech. Outlook: The Ravens will be under a new head coach this season as Robert Polselli takes over for Michael Jessie. Polselli comes over from Two Rivers High School, which merged with Innovation following its closure. And it will be that piece will be the most intriguing to watch over the season and how the chemistry of the team forms over the course of the year. Innovation does bring back some standout players within its league, most notably senior Imani Rosado at first base and junior Isabella Orejuela in the pitching circle. Overall, Polselli sees hitting and running as strengths of the team this season while defense could be a weakness. The Ravens have been known to commit a number of errors each game in the past. It will be interesting to see how or if they are able to overcome that. How they will do, though, is still to be determined. Posted in New Britain Herald, Berlin, Goodwin Tech, Innovation, New Britain, Newington, Plainville, Southington on Friday, 30 March 2018 21:16. Updated: Friday, 30 March 2018 21:19.